Divorces can be messy. Often they are fraught with feelings of anger and ill-will. In these cases, settlements can drag out over weeks or months. There is, however, a better way. Here’s how to keep your Florida marital settlement agreement clear and concise. Perhaps the best way to keep a marital settlement agreement clear and concise is to control your own emotions. Sure, divorce can be an extremely difficult time mentally, but keeping your emotions in check is critical. If you are overtly emotional, your spouse and their lawyer have gained the upper-hand in negotiating, as they now understand what triggers you. Being not in control of emotions can also drag out proceedings, as well as make negotiations more hostile. One of the best things you can do to try and keep your marital settlement agreement clear and concise is to take a step outside of yourself and picture things from the other side’s point of view. Thinking about how your spouse may see circumstances is a great way to reach and understanding free of malice or ill-will. Once you can acknowledge any emotional triggers which may set off your partner, you will be better equipped to handle your negotiations. Often you may find that partners are less concerned about finances in a divorce and more about having their emotional needs met. Transparency is crucial for any settlement to be reached amicably. It’s difficult to reach a reasonable settlement if there’s no trust between the parties involved. Being open, honest, and providing as much information as possible can build the element of trust and thus speed along the proceedings. Providing clear information about financial or property holdings, for instance, can give a complete picture to a spouse about the realities of the situation, say, for example, if they were expecting a lucrative settlement where one is simply not possible. If you are willing to go the extra mile to educate and inform your partner and their attorneys, that element of trust opens the door for a much faster – and more amicable – settlement. Perhaps the best way to reach a clear and concise Florida marital settlement is always to try to reach an agreement which both parties can happily accept. Burning bridges solves nothing, neither does being petty. To keep any deal simple and clear, always try to adopt a policy of giving and take. If you think your spouse may be “gold-digging” for example, try to look a little deeper. Maybe they are looking to go back to school, or even have family medical issues to consider. Try to work with each other to satisfy both parties, and your divorce agreement will be much easier on everyone involved. 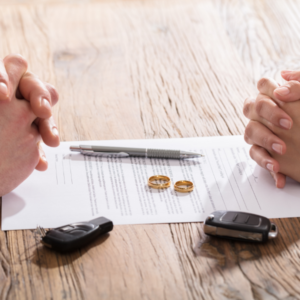 If you are considering divorce, you need to contact an experienced attorney right away. As contested divorces can be difficult situations to navigate, you need an attorney who knows how to get you the results you want and need. Patrick Cordero has extensive experience in all facets of law, including family and financial law. Call The Law Offices of Patrick L. Cordero for a free consultation today at (305) 445-4855. This entry was posted in BLOG on October 3, 2018 by wpadmin.